Different jurisdictions have different concepts. 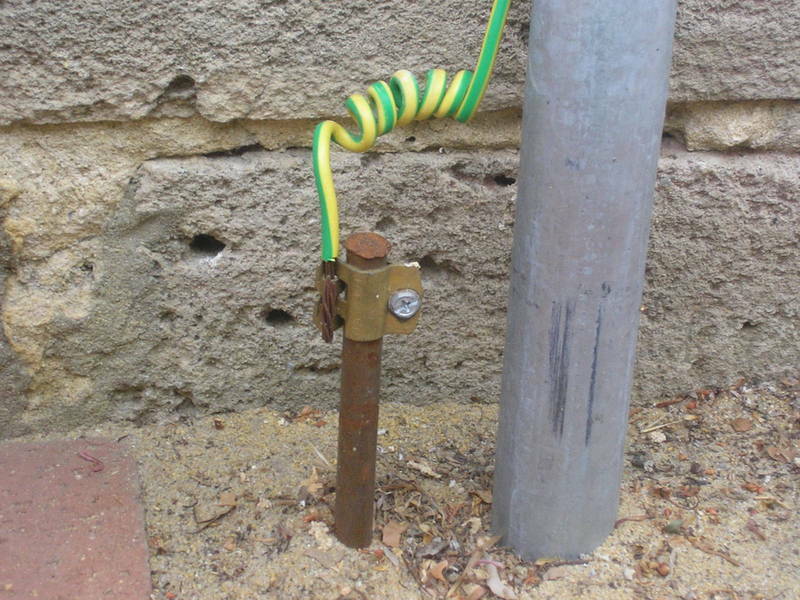 This ground rod in Australia has a six turn coil at the rod connection point. This must be to discourage lightning from entering the AC grounding system. In the U. S., it's the opposite, we require the AC and lightning protection systems to be bonded and this coil would probably result in a disapproval. I wonder what the down under experience is compared to the U. S.? Actually, that coil has very little to do with lightning. What it is meant for is a bit of spare length in case either the building moves on it's foundations or the earth stake needs to be re-terminated for whatever reason. The MEN system of supply down in this part of the world depends very heavily on this one wire. I have seen that before on low voltage wires in HVAC. It is sort of a shock absorber to relieve some of the strain on the wire from flexing etc. Sort of like the curly cord on your phone handset. Last edited by jdevlin; 09/20/10 10:53 AM. It WILL add a bit of inductance, which will decrease the effectiveness of the grounding system at handling fast risetime transients. If one was to make the rod 'flush' with grade, would the curly Q be long enough to allow that? Perhaps, the inspector wanted to see the rod, and clamp prior to it being driven flush. Or, are the codes in Australia not the same as stateside that the rod must be 'flush'? How much inductance and how much more damage from a lightning strike will this inductance cause? My GUT feeling is not much. That wire looks to be equivalent to about 10 AWG. You are allowed to install them flush, but it is not a requirement. Another difference between Aussie practice and US practice is that here the use of a green (or green / yellow) wire for this application is actually forbidden. The style of the connection has long been disallowed here - by local rules, if nothing else - since the 70's. At that time, there was a campaign against that method, asserting that such connections were too easily damaged by lawn mowers, weed whackers, and the like. I think 'inductance' is the wrong word; I think the word we ar thinking of is 'impedence.' As in, a coil of wire has a greater impedence than a straight wire. Since impedence is an AC phenominum, I am not sure the coil would have any effect on current flow caused by a (DC) lightning strike. Lightning though not AC, shares more in common with AC than DC with its sharp rise times and varying currents. If you look at strikes with a spectrum analyzer you would find that each strike is built of multiple frequencies across the specturm. To do a complete analysis of the effect this pracitce would have on the lightning strike depends on each individual strike. With that said let's assume that we happen to have a direct building strike to the electrical equipment with its major component frequencies in the 100 kHz range (somewhat typical but again vaires widely) and the that the coil provides 0.001 mHenrys the impedence to the major component of this assumed strike would be (1j + negligible resistance) ohms. If the current portion of the frequencies where a small 5000 amps (strikes can range from a couple thousand amps to 200,000 with super strikes easily exceeding this range) then the voltage drop across this coil is 5 kV. That is significant and will be the cause of loss equipment inside the building in a direct strike. Someone who is a ham radio operator would quickly be able to estimate the inductance of the coil, but say the inductance is 100 times greater (a mere 0.1 mHenries), now we are looking at 500 kV. I am not going to look up the formula though I should have it memorized somewhere. I recommend against this practice. NFPA 780 inhibits bends to not exceed 90 degrees from straight and that the radius of the bend be 8" (about 20 cm) minimum. The colour of earth (ground) wires, was changed down this way some years ago, mainly because of the earth wire in flexible cords. Colour-blind people wiring plug-tops on to the ends of flexes are most likely to transpose the red (phase) and green earth wires. In effect, all earth wires are coloured with the yellow stripes, and I must say it makes it easier to identify an earth wire in a switch-board panel where you don't have a lot of ambient light. BTW, that wire in the photo is #10 AWG, it is known as 6mm� down this way. The clamp looks rather old though, they are a LOT more substantial these days.